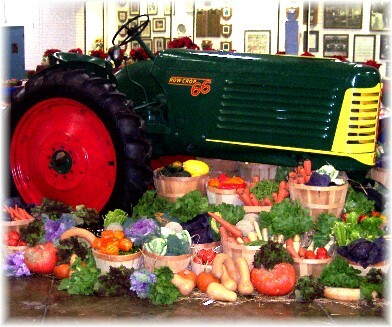 A restored 1950 Oliver Row Crop 66 tractor surrounded by a colorful bounty of locally grown produce. Today I will be taking an Amish dairy farmer friend along with his children in to the Pennsylvania Farm Show in Harrisburg. "The blood of Jesus His Son cleanses us from all sin" (1 John 1:7). "If we confess our sins, He is faithful and just to forgive us our sins, and to cleanse us from all unrighteousness" (1 John 1:9). This last Friday I shared a message using a pacemaker experience Ester had to illustrate a spiritual truth of how the Lord directs our hearts. That brings to mind another medical procedure that also has a spiritual application. Many years ago Brooksyne had a volunteer role with Red Cross in which she transported kidney dialysis patients from the town where we lived in northern Pennsylvania to the nearest dialysis center some 32 miles away. However I suppose I had never really considered this process, although I've had folks in my churches that were either on dialysis or had family who were. The last year of his life my dad was on kidney dialysis. I recall going with him to the dialysis center and found it interesting to observe the procedure on my dad and I asked the technician questions as he was dialyzed. At that time the process took about four hours and even with all the high tech machinery it does a rather primitive job compared to the two little organs (our kidneys) that I doubt many of us rarely, if ever, thank God for. The process, which is repeated every two to three days attempts to do the work that our kidneys do constantly without any thoughtful input on our part twenty-four hours a day, every day. The kidneys not only remove waste products, but also maintain a constant balance in the various chemicals in our bloodstream. This is vital to our well being. A bit too much or too little of a certain chemical can wreak havoc. Accumulated poisons rapidly weaken and destroy. Sin has the very same affect in our lives and our daily verse is one of the great promises in the Bible. We both memorized it very early on. "If we confess our sins." Confess means to come to agreement and acknowledgment concerning our sin problem, both generally and specifically. I like an old definition of sin that states "sin is any want of conformity to, or transgression of the holy law of God." This standard clearly reveals the reality that "all have sinned and fall short of the glory of God" (Romans 3:23). "He is faithful and just." This is a promise based on God's immutable character; His attributes of faithfulness and justice. "To forgive us our sins." Our greatest need in spiritual restoration is forgiveness of sins. God faithfully and justly forgives! "And to cleanse us from all unrighteousness." 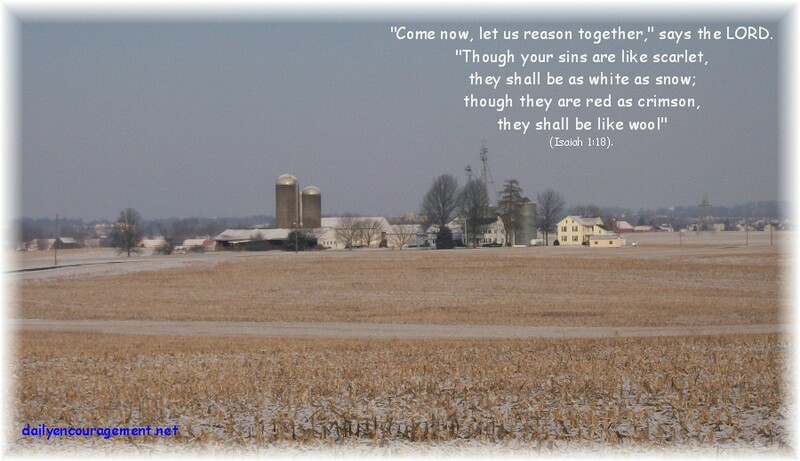 An old hymn has a stanza that describes the effects of sin and the results of Christ's atonement: "sin had left a crimson stain, He washed it white as snow." Rejoice today at the totality of this cleansing in the phrase, "all unrighteousness." Our confession of sin is a spiritual dialysis. Even as in a healthy body the kidneys function constantly to cleanse, so spiritually our regular confession of sin cleanses us of all unrighteousness. I like that little word "all." It speaks of the complete efficacy of the spiritual dialysis ordained by God. Let us all come to the Father and confess our sins before Him today. Through the atoning blood of His Son Jesus He will be faithful and just to forgive us our sins, and to cleanse us from all unrighteousness. Hallelujah, what a Savior! Daily Prayer: Father, in exchange for our filthy rags You clothe us with a garment of praise. Our sins of crimson are lifted and we are washed white as snow. While we were yet sinners and powerless Jesus died for us, the Godly for the ungodly, and we are now covered by His cleansing, atoning blood, destined to reign with Him forever in heaven. Words are totally inadequate to express our thanks but we dedicate our lives to that purpose. Ours is a deep, eternal gratitude to You for Your matchless mercy and grace lavished on us. Amen. Ester's health update: Friends, thank you for your prayers, personal notes and well wishes for Ester's recovery following her cardioconversion on Saturday. Thankfully she was released late yesterday afternoon from the hospital and is resting at home. Medications have been adjusted and changed. Hopefully...prayerfully, we will not revisit this health issue in the future. A bit of humor: Upon leaving our nurse encouraged me to fill out a form about the care we received at the hospital which was excellent as it has been over the years. She said, "You don't have to put your name on the form. You can turn it in as unanimous." I chuckled quietly inside as it was the first time I'd heard anyone mistake the word "unanimous" for "anonymous". It also reminded me of how easy it is to make a mistake in our writings. Thanks to you who bear with us and likely have a chuckle now and then when you see our errors. And if you want to you can even laugh out loud since the writer and editor won't even hear you! "Whiter Than The Snow" Video Singer not specified but a beautiful song. The Pennsylvania Farm Show is a huge indoor agricultural show with many interesting exhibits large and small. It's similar to a summer state fair but here in Pennsylvania they hold it in the winter. This afternoon they are calling for a storm to come through our area as well!